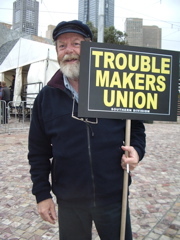 The Melbourne Branch of the Australian Society for the Study of Labour History promotes, preserves and produces radical, political, and working class history. For over fifty years the Branch has published its newsletter Recorder, held regular meetings with guest speakers or seminar discussions, and organised conferences and events. Each year the branch awards the Sam Merrifield prize for the best article by an early career researcher on labour and radical history. If you would like to support our work we would be very pleased to receive your application to join or renew your membership of the branch. It only costs $15 per year. Click here to download the membership form. You can also subscribe or renew your membership subscription to the Melbourne Branch via PayPal. For a one year membership to the branch please click on the link below. You do not need a Pay Pal account for this option. To set up a recurring payment for your subscription please select the button below. You will need to have, or to set up, a PayPal account for this option – please note this option can be changed at any time. Our cover image is cropped from the photograph above. It is just one of the many magnificent photographs taken by Graham Howe at the 1971 Moratorium to End the War in Vietnam. It is used here with Graham’s permission. Copyright remains with the photographer © Graham Howe 2014.